When it comes to science-fantasy and horror roleplaying (and miniature wargaming), there aren’t many games that can hold a candle to Warhammer 40K for tone, content, or style. However, back in that nebulous pre-historic age called “the early nineties” there was one spunky game that gave 40K a run for its money. That game was Mutant Chronicles, and it’s back on Kickstarter. You get the idea. It’s a big, sweaty, manly game. Full of too-big pauldrons, and even bigger guns that are called Bolters for some reason. There is magic, too, and of course most of that magic is constrained by the Brotherhood, churchy folk who govern it’s use with a steely Inquisition… Yes, it is very much similar to that other game. Of course, that’s not too surprising, given that 40K and Mutant Chronicles owe a debt of gratitude to the same inspirations–edgy, raucous magazines like 2000 AD and Heavy Metal, which influenced everything from the tone to the art styles of both games. That said, there are some critical differences between the two, which, in my opinion, can make or break a game. For instance, the scope of 40K’s universe is vast in comparison to that of Mutant Chronicles, which is limited to just the solar system, which can be a pro or a con depending on a gamemaster’s needs. I think that some of the psycho-social divisions between the games are more critical, however. For instance, in the Mutant Chronicles, people are very much aware of how their technology works and why they cannot use computers. Humanity hasn’t “forgotten” anything, and there is no hoary cult of machinists making a circus of pushing the “On” button (it’s amazing how big this gulf is for some players, who can’t wrap their heads around being ‘ignorant’ of technology’s workings as in the 40K setting). That said, the biggest distinction I see is the simple fact that Mutant Chronicles contains an underpinning of hope. While nearly all of the living beings in 40K’s known universe contribute to the unceasing tide of Chaos, which will inevitably overcome them and then, victorious, itself gutter out for the lack of emotions to feed on, leaving a crypt-like universe devoid of, well, anything, the people of the Mutant Chronicles are fighting a winnable war. Their evil can be overcome, imprisoned, and ignored. That’s not to say that victory is assured, but it is possible. Given that 40K-verse more or less forces players to come to terms with the fact that they are the cannon fodder, that tweak in tone can make all the difference for some groups. I won’t say which I necessarily prefer, but sometimes grimdark can take a hike. For this go-round, Mutant Chronicles is going to be published by Modiphius, another UK based publisher. The 3rd edition of the game promises an all new “fast and furious” rules set, which is good, considering how painfully 90’s the original is. According to the project page, Modiphius is leveraging the existing story line but rewriting the material, which is big plus for gamers against copypasta (such as yours truly). One spot of contention that remains unclear to me is whether Modiphius, who are publishing the RPG, have any interaction or collaboration with Prodos Games Ltd. who previously Kickstarted a new version of the Warzone mini wargame, which was the MC-linked wargame back in the games first life. I think some degree of connectedness is crucial for fans, given that Warzone and Mutant Chronicles overlap by design, where Fantasy Flight Games is given carte blanche to create heretofore unheard of sectors in which to situate their 40K tie-in RPGs. Of course FFG’s workaround is not an option here, but it’s my opinion that fans deserve some degree of coherence. Anyway, that’s not such a big deal. What is a big deal is the price. The all-digital level comes in at 40 pounds. For the math averse, that’s over $60 US. Steep, in my opinion, but should various stretch goals be met, it looks to be quite a lot of content. Also worth noting is that fulfillment comes from the UK, so US shipping for non-digital rewards is perhaps a little steeper than we Yanks are accustomed to. All that said, after hearing about this project, I dug out my old first edition rulebook and took a trip down nostalgia lane. 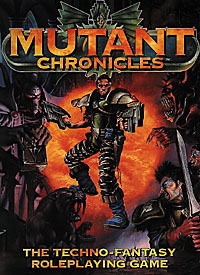 Mutant Chronicles is a great game with a great pedigree—hell, it even had a motion picture (do not, under any circumstances, watch it. Consider this a warning)! If you’re looking for a 40K-alike (with a dash of Firefly, ten years before it’s time), look no further than Mutant Chronicles. You’ve got just over a month to pledge. I really liked Warzone, and got into it just before it mysteriously disappeared (1st edition I think; whichever one was from Target Games). The “players alternate moving squads” mechanic was new to me (I had only played the “your turn, then my turn” of Warhammer previously), and I thought it gave a lot more life to the game rather than the massive ebb and flow of the “other game”, as well as keeping both players engaged. Also, the Warzone setting seemed much more interesting, and the Dark Legion seems more driven than Chaos. Plus they have a mix of everything: human traitors, undead, demons, etc. I also liked that humanity wasn’t united; the Megacorporations all had a distinct style (both aesthetic, and to a lesser extent in gameplay). Overall I think Warzone felt grittier and was easier to relate to (in a sense). While I love the trappings and scale of the 40K universe, I have to agree that the Dark Legion is actually a better adversary. The setting is actually grittier in ways that make it seem really and deadly, as opposed to the grim darkness played for larfs of quite a lot of the Warhammer canon. Ultimately, I’m glad someone is doing something with the property. It’s worth it. Fond memories of the original game, so recently I DL’ed a pdf copy…man was that game top heavy. Glad to hear they are streamlining it. Can’t wait to see what it looks like if they get it out.